slave david was a 50 year-old slave born and raised in the state of Missouri, in America’s Heartland. At the tender age of 19, he was collared and owned for the first time and his service lasted for two decades. That experience was long and abusive, but with the help of Master Taíno, slave david has been healing and overcoming that bad experience. slave david was released by his Owner in November 2004 after he decided to return to Europe and could not take the slave with him. A couple of months later , slave david moved with a sister to Clearwater, Florida. A new friend at a leather bar recommended him to read Master Taíno’s website. he did, but took him a month before he wrote to Master Taíno and petitioned to be taken into Master’s service. Master Taíno arranged for slave david to attend His Academy’s slave Training Weekend after He realized that the previous service of the slave was much different that the way he sees slavery. According to slave david, the main thing he learned already is that slaves are still human beings. The Training Weekend was an eye opener for slave david who accepted the invitation to stay at Master’s house for a period of training and probation leading to full ownership. slave david is committed to continue his slave journey under Master Taíno. In the evening of Master Taíno’s 55th Birthday, slave david signed the slave contract offering himself as a gift to the Master and becoming His slave and property. he is a 24/7 live-in domestic slave although he works outside the home. On August 11, 2009, slave david completed four years in service to Master Taíno and October 24, 2009 marked the fourth anniversary of his slave contract. 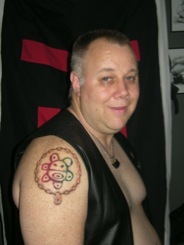 To mark the occasion, slave david had a tattoo done with the family crest in his right arm, something he is very proud of. He received the slave bill Volunteer Award 2012 during the Master/slave Conference. slave david has become the IT guru for the household. He also manages all IT for MsC including being the Office Manager and setting up and managing the online registration system. For MsC 2014, slave david was also the website manager. After almost nine of service, slave david asked for and obtained his release and moved to Philadelphia to start a new job and a new life. 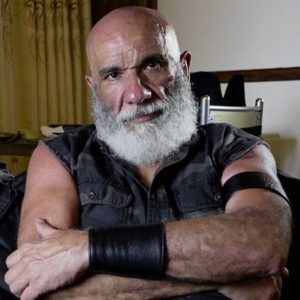 On the evening of August 31st, 2014, he had a traffic accident in his scooter and passed away the next day, September 1, 2014. A memorial service was held by our Family at the Baltimore Playhouse on Sunday, October 19. His ashes were scattered in early December from two sides of the Atlantic Ocean as slave jenna scattered half of them from South Africa, while the rest was scattered from the coast our the state of Virginia. 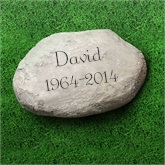 Rest in Peace, slave david.